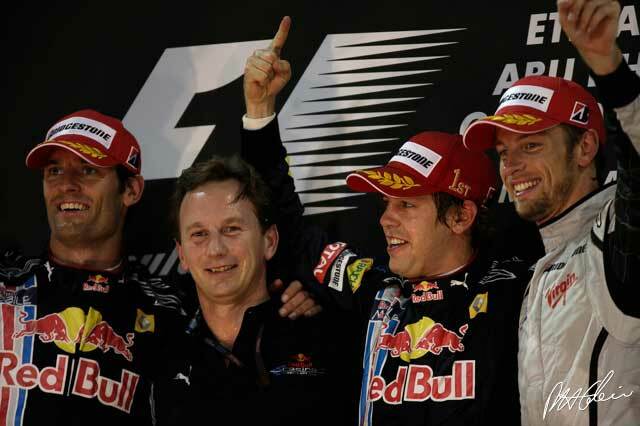 Sebastian Vettel gave Red Bull Racing a hat-trick of wins to finish off the 2009 season with a dominant victory in the inaugural Abu Dhabi Grand Prix. Although Lewis Hamilton qualified well and led from the start, it was clear early on that the McLaren driver was not able to pull away from Vettel and at the pit stops was overtaken by Vettel just before he went out with a rear brake problem. After that Vettel was untouchable. It was not a great race, overtaking clearly being very hard, but there was some excitement in the last laps as Webber struggled to hold off a charging Jenson Button. Vettel's brilliant win cemented second place for him in the Drivers' World Championship behind Button and ahead of Rubens Barrichello, who was never able to challenge and had to make do with fourth place. Hamilton led away at the start, but was already beginning to experience braking problems before he refuelled on lap 17. He had twice run wide in the sweeping corners and when Vettel ran three laps longer before stopping he was able to exit the pits comfortably in the lead. Soon afterwards Hamilton's challenge ended when McLaren had to withdraw his car after the telemetry revealed a problem with the right rear brake pads which were suffering from excessive wear. "It was a fantastic race," Vettel smirked. "I had a very good launch at the start even if it was not good enough to out-accelerate Lewis. But down the long back straight he pushed the magic KERS button that we don't have and disappeared into the distance. But I was soon able to stay close enough. The car was a dream today, and I was always catching him quite a lot. That was the secret. There was a lot of pressure on me when I was going into pit lane and I went wide, then there was the scary exit, but I was fast enough to go past him." McLaren's engineers tried to get Hamilton into a brake-conservation mode, but when the unusually high wear-rate refused to respond they had no alternative but to withdraw him after 20 laps rather than risk possible failure. "I had a good start, but I realised early on that something wasn't right with the brakes," the outgoing world champion said. "After three or four laps, it became clear that there was a problem with my right-rear brake pads, so I couldn't open up the gap back to Sebastian and Mark." "When the problem got worse, the team radioed me and told me to stop at the end of the lap. It's a shame that we couldn't show the performance we'd had throughout the weekend - but sometimes that's racing. But I think we can be really proud of our efforts: who'd have thought we'd finish third in the constructors' championship at the start of this season? It's been an incredible year, and now I can't wait for next season to start so I can fight for the world championship again." Hamilton's demise moved Webber up to second, with Button at that stage a distant third ahead of Brawn team-mate Rubens Barrichello. The Brazilian had run ahead of the Englishman on the opening lap but clipped Webber's left rear wheel with the right-hand endplate of his front wing, causing understeer. Button overtook, and chased after Webber though just after his first pit stop he again had to give best to impressive rookie Kamui Kobayashi, until the Toyota driver finally made his sole refuelling stop after 30 laps. "It was a fun race," Button said. "For me the harder, prime Bridgestone tyre was not my favourite tyre. In hindsight two stints on the softer compound option tyre would have been better and might have let me get closer to the Red Bulls, but we didn't expect it to be that way. The prime had been better up until today and it was the better tyre for qualifying, but I had a lot of understeer on the primes in the first two stints and as the temperature dropped the darker it got it became difficult to get heat into the front tyres. In the second stint Rubens was behind me, sitting on my tail. But then the soft tyre transformed the car in the final stint and suddenly I was able to pull Mark in. Suddenly I had this great front end, with lots of grip on initial turn in, and I could then carry more speed into the corners." That switch coincided with Webber struggling on his option tyres, which he said did not give him much feel or confidence, and suddenly what had been a seven second gap began shrinking at an alarming rate. On the final lap Button actually drew alongside Webber at the end of the 1.2 km back straight, but the Australian handled the situation beautifully, hogging the inside line and forcing Button to go to the outside. They ran side by side for a while, but Webber was able to keep his second place by 0.6s. "When you're getting caught you really have to make sure you don't make any mistakes and give the guy something," Webber said, "so I just had to make sure he had to work for it." "It was a good tussle, a fair fight," Button said, "but though I got alongside I just couldn't quite make the move stick. I thought I might pull it off but Mark is always difficult to overtake. It was clean but the on the edge. And it was great to end my championship year with a podium finish." Barrichello stayed third in the championship with his fourth place, while Nick Heidfeld saw BMW out in style with a decent fifth. "I am very happy," Nick said. "It was a good race in which I was able to get the maximum out of the car and score four points, which was enough to reach our target for the end of the season to overtake Williams in the constructors' championship. After I have been a little unlucky in recent races, this time I was really able to exploit the car's potential. For quite a long period I was able to go at the same speed as the World Champion's car, the Brawn. The strategy to go for a rather long middle stint paid off and the track was even more fun when it had more rubber on it. It is a pleasing end to our last season together. It now becomes very emotional. During the last laps I had to pull myself together in order to keep my concentration." The revelation of the race, once again, was Kamui Kobayashi, who drove his Toyota like a demon and, when he was running at his lightest in a one-stop run and Button had just refuelled, gave the World Champ another seeing to as he sped by the Brawn and forced Jenson into overshooting Turn 8. "The first big stop after the pit stop was Turn 8 where it's very difficult to judge the braking point when you have lots of fuel onboard," Jenson admitted. "I just outbraked myself, but in reality it made no difference to my race because he was quicker at that point." "It was a really good race for me. At the start I overtook (Kimi) Raikkonen and that was important in the end because it would have been difficult to finish in the top six if I had been behind him during the first stint. When I got past I was confident I had the race pace to fight for the points and my target was to be consistently fast. The team did a great job with the strategy and the pit stop which played a big part in helping me finish in the points. I certainly wasn't expecting to be racing in Formula 1 this season." Jarno Trulli was seventh after a two-stop run in what may transpire to have been Toyota's last race, while Sebastien Buemi survived a tough fight and a brush with Robert Kubica, which left the Pole spinning, to take the final point. "Getting another point today, after also scoring in Brazil, is a nice way to end the season," Buemi said. "I lost a bit of time behind Nakajima, but overall I think I did the best I could and it was a great race. My fight with Robert was quite fair, and I think I left him enough space." Nico Rosberg was ninth in his last race for Williams, yet again believing that he'd got the best from his machinery, and a recovered Kubica was 10th. He did not agree with Buemi's assessment of their fight. "I lost the race in the second stint when I was very slow, while in the first stint I was able to go at quite a good pace, similar to Rubens," Kubica said of his final outing for BMW Sauber. "The car was working very well. After changing tyres I had no grip at all. The track was getting quicker and I just could not go at the pace of the other drivers. This was very strange. My fight with Buemi was quite tough and a bit dangerous. We nearly touched when braking into the chicane. He first moved to the left and blocked the inside of the left hander. When I moved to the right he pushed me over the high inside kerb of the right hander section of the chicane and I spun. He did not leave any space at all." Heikki Kovalainen fought up from his 18th place start to 13th initially, and went on to finish 11th in a one-stop run, but for the latter half his KERS was awol so he had his work cut out for him. He headed home fellow Finn Kimi Raikkonen's uncompetitive Ferrari, Kazuki Nakajima's Williams, Fernando Alonso who took his Renault until the 34th lap before his sole refuelling stop, and similarly single-stopping Tonio Liuzzi whose Force India was the last unlapped runner. "We knew we did not have a car that was competitive here," Kimi said. "It's a shame to end my time at Ferrari with this result, but this year we have never been in a position to fight for the win at every race, as I would have wished." Alonso could have echoed those sentiments. "The result today is disappointing," said the plucky Spaniard. "I'd like to thank the team for everything we've achieved over the years. We had some great victories and won championships together. It has been the most amazing seven years of my career and something I will never forget." "Overall I thought we got the maximum from the car today, but unfortunately we had a problem with the brakes more or less from the beginning so we couldn't really fight for positions," said Liuzzi, who will definitely stay on a two-year contract starting in 2010. Giancarlo Fisichella had a final feeble run chez Ferrari, and after a drive-through penalty for pit lane speeding was later able to jump Romain Grosjean's Renault in the closing laps to take 16th. The Franco Swiss driver was so unsettled that Adrian Sutil also sneaked by in his Force India. So, it was far from a great race, even if this is a great place. But with his fourth victory of the year Vettel clearly signalled his potential for the future. "This evening it was a pleasure to sit in the car," he beamed. "The second half of the season has been very strong for us, so congratulations to the team, they have been pushing a lot back in the factory. It's a shame the season ends now, to be honest, but a perfect way to finish the season on a high."